You are currently browsing the tag archive for the ‘mango’ tag. Brian did a lot of planning, shopping for, cooking, and serving of the three daily meals, but his additional responsibilities meant a second cook was a requirement. So we hired a local chef. I’ll call him “Check”. Check and I got off to a bad start. On day one, our toddler and new puppy were wrestling, as youngsters do, and when the puppy’s sharp teeth made Simon cry out in surprise and pain and hurt feelings, Check rushed to Simon’s defense and swatted the puppy across the room. In turn, I rushed to the puppy’s defense. Our relationship spiraled downward from there. More than once I’ve been told, “You’re so….calm.” Maybe it was a kind way of saying I’m dull or emotionless, but never has anyone told me I seem explosive or the type of person who thrives on conflict. But that was Check’s and my relationship. I couldn’t wrap my head around it. The after effects of each conflict reverberated to Brian. I lost track of how many conversations we had about whether to let Check go. But, where would that have left us? With Brian cooking and prepping every single meal, every single day. Check was too skilled in the kitchen, too capable of creating his own menu, and too able to wow our guests with his food. And they liked him. How could they like him? At the time, I didn’t get it. Now that some time has passed, the reasons for that continual clash are clearer to me. Check was well read, had lived outside his country for a period of time, had strong opinions about foreign and local politics, and knew well the life of injustice, including a double whammy of recent occurrences. Then I landed on his soil–a white American woman with countless freedoms, slightly younger than him, ready to take charge and make my personal dream a success. A recipe for disaster. In honor of Check, I wanted to share a signature recipe of his. However, he didn’t leave his recipes lying around. So I thought I would recreate the parfaits he often made for dessert. How hard could it be, I thought. Hard enough to point out that a food blogger I am not. I thought I would be all style-y and pour the warm panna cotta in the glass at a tilt, but I didn’t think through that the coulis wouldn’t stay in place at an angle, and the mousse definitely wouldn’t cooperate with the angle. So each one is a new attempt to make it look presentable. It didn’t work. The good thing is that each of these three layers is still delicious. 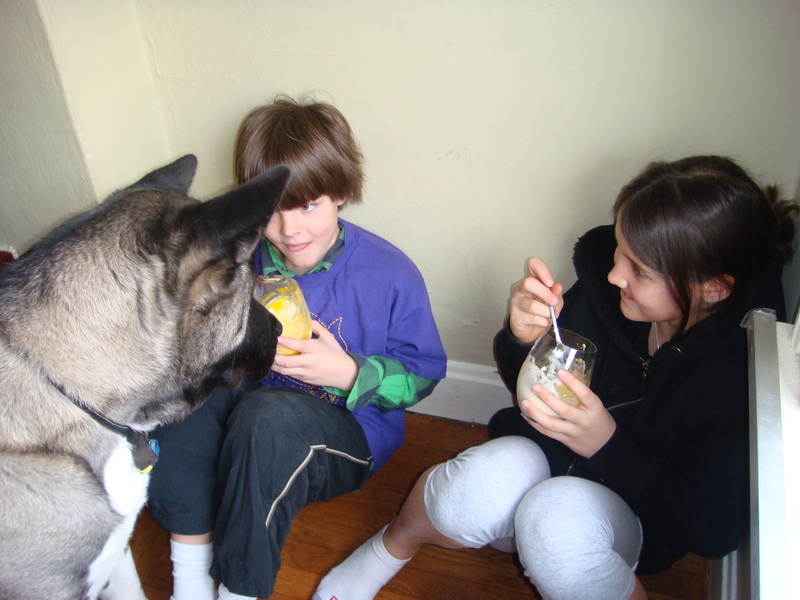 Comments from the tasters: Simon (now 8): “It’s delicious just the way it is.” Remy (now 11): “If you like mango, you’ll like this.” Even our Akita, Hoshi, tried it. He would have eagerly finished it off if we allowed him. For what it’s worth. What I should have done was consult with my chef husband before starting this experiment, rather than after. His suggestion of starting with the mousse on the bottom, then add the coulis, then the panna cotta was the answer. Here’s my final attempt. 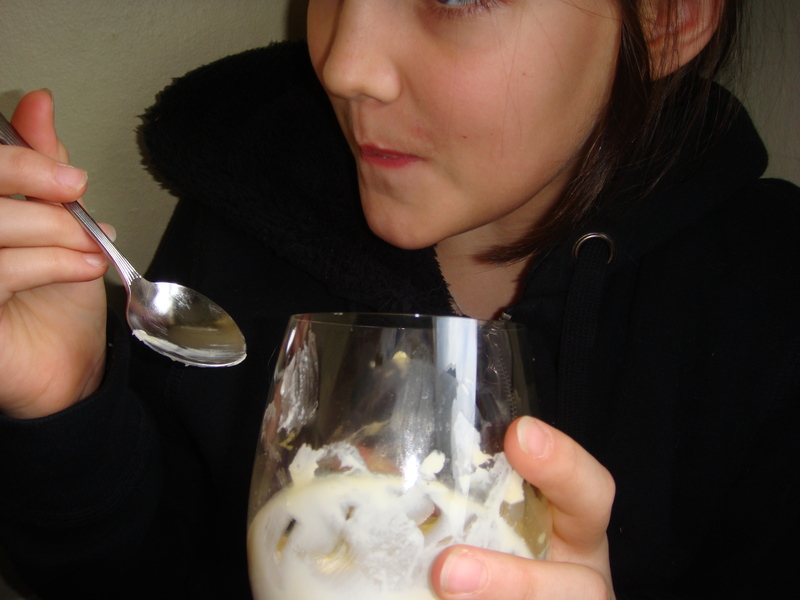 Since the panna cotta had already set, I whisked it again which made it creamy enough to spoon over the top. 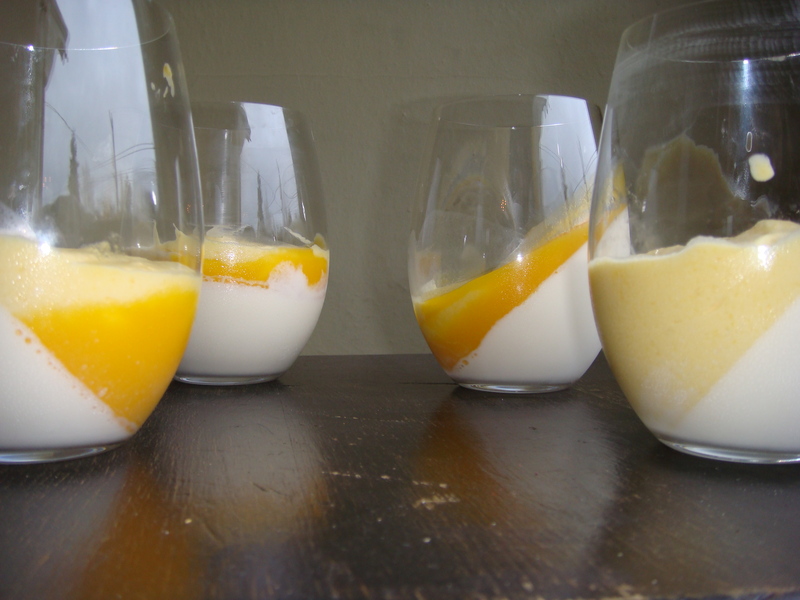 Or alternatively, you could put a dollop of the mango mousse on top the panna cotta. 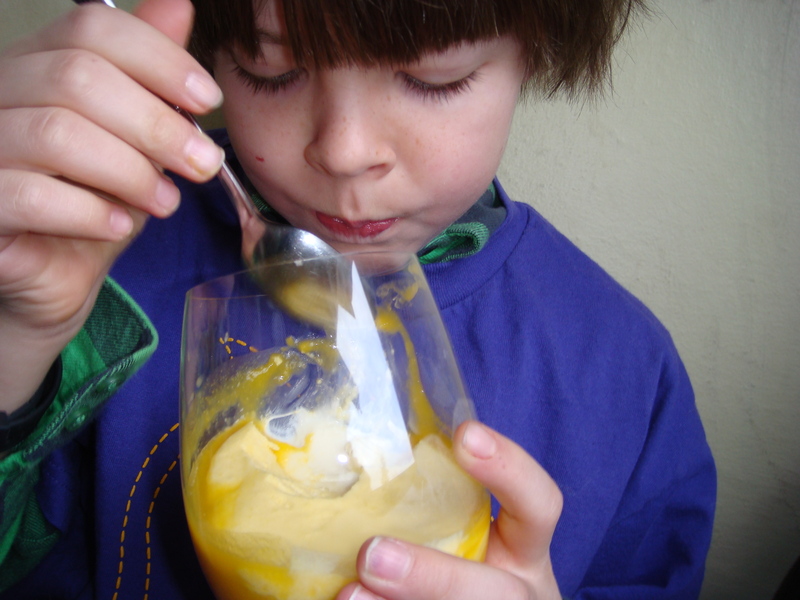 Or scoop some mango mousse into a bowl and decorate with the coulis. Or try just the panna cotta with a zigzag of coulis over it. Go ahead Check, shake your head at me again. 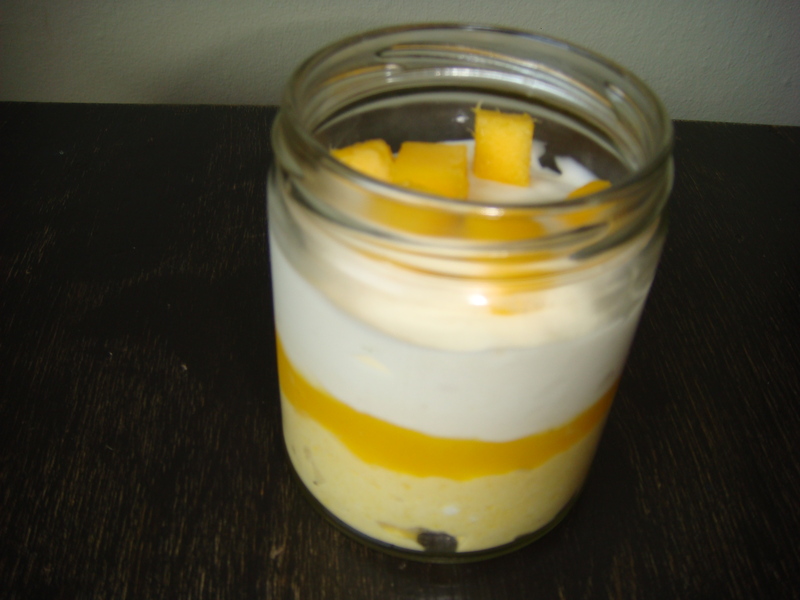 Check would make parfaits with whatever fruit was available, be it mangoes, guavas, passion fruit, bananas, even plumrose. Pasteurized heavy cream isn’t available on St. Vincent so instead one is forced to use this gloppy stuff labeled as cream that could, if you’re careful, retain the shape of the can from which you expel it. Using real, refrigerated, liquid cream is a luxury here. Sprinkle gelatin over lime juice in a small heatproof cup and let stand 1 minute to soften. Purée mangoes with sugar in a blender or food processor and force through a sieve into a large bowl. Melt softened gelatin in cup in a pan of water on low heat, then stir into purée. Beat cream and sugar with an electric mixer until it just holds stiff peaks and gently fold into purée. Chill, covered, at least 8 hours. Puree mango and sugar in blender or food processor. Force through sieve into bowl. Pour ½ cup of the milk in a saucepan and sprinkle the gelatin over it, let sit for 5 minutes. Heat on low, stirring until the gelatin has dissolved. Add remaining milk, cream, vanilla and sugar and cook over medium heat until steam rises from the pot. Remove from heat, cover and let sit for 15 minutes. Pour into six cups. Refrigerate until set.